We are a small, family-owned and operated wool and fiber mill in northern Illinois. We have carefully chosen each piece of our custom-made milling equipment to provide state-of-the-art milling service to our customers. Our particular focus is to assist small family farmers and shepherds in producing beautiful, custom-made, marketable products (roving, batts, clouds,corespun rug yarn, and traditional plied yarn) from their fiber animals (sheep, alpacas, llamas, camels, goats, rabbits,etc.). We invite you to drop us an email or give us a call, and let us see how we can help you achieve your fiber dreams! 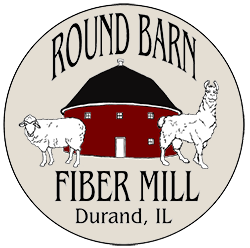 Round Barn Fiber Mill Inc. Round Barn Fiber Mill will be vending at the following 2019 fiber festivals! We will provide information about our processing services, accept fiber for processing (saving you on shipping), and at most events, will be selling products made in our mill. Come say "hi"! Check back here for schedule updates, as additional festivals may be added!